Peet's Coffee is a specialty coffee roaster and retailer with Cafés in regional areas of the US. 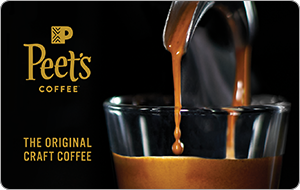 Peet’s is known for its early introduction of darker roasted arabica coffee, such as French roast and grades appropriate for espresso drinks, and coffee retailing for freshly roasted beans and in-store brewed coffee. Giftogram takes out the guesswork and helps you create goodwill with one gift card, good for an eGift Card of their choice at hundreds of retailers. Recognize birthdays or special anniversaries, customer service or apology gifts, rewarding survey participation or simply building goodwill. Holiday gifts, birthdays, life events, milestones, anniversaries, retirement, wellness programs, on-the-spot rewards or just to say "thanks." Give them any gift card they want with the ability to use it anywhere, at any time — including right from their phone. Yes, it’s as great as it sounds. The convenience of a digital gift card with the personal connection of a physical gift. With all of today’s top brands, they have plenty of options for whatever the mood. Giftogram was designed from the ground-up for a simple experience that can be done entirely from their mobile device. Traditional reward & recognition programs will have you believe that choosing merchandise out of a catalog is real choice. Nothing can match the real, unlimited choice of letting them choose their own eGift Card. Tell us a few things about yourself and we'll show you just how easy it is to buy bulk gift cards with Giftogram.